Junior Infants Room 5: A visit from the Fire Station! We hope everyone enjoyed our Winter Concert today! Looking at all of the pictures from throughout the year was lots of fun and reminded us of all of the brilliant learning we have done this term. 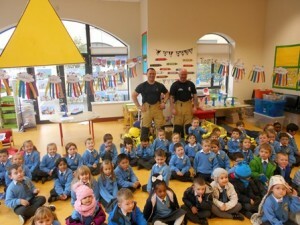 Before we finish the term we wanted to share our visit from the firemen with you all. The two firemen came in to our school after a long nightshift – thank you very much! We learned lots of facts about fire safety, including what to do if there is a fire in our house. We all brought home our fire safety packs and planned an escape route in our houses with our families. This is very important because lots of fires happen in the night time when it is dark. Then, the firemen let us try on their band new gear – this protects them when they are fighting fires! To check out our pictures of the firemen’s visit click here. We hope you have a lovely holiday and to our families celebrating Christmas – Happy Christmas from Room 5!